• Sturdy Tent-Like Shelter Offers Birds A Place To Hide, Play and Sleep. • Plastic Inserts In Side and Bottom Help Maintain Shape and Fabric Is Machine Washable. • Sewn-In Hooks Allow For Easy Insertion Into Cage. Sterilized 100% all-natural materials and fibers. 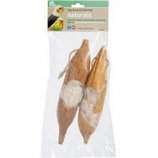 Soft silky fibers satisfy nesting and bedding activities. When pod is empty leave it in the cage for use as a hideaway or refill with additional fibers and treats. 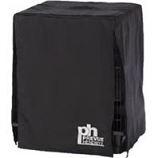 Ideal for small to medium sized birds like finch parakeet lovebird and cockatiel. .
Universal cage cover for bird cages ranging from 18x18x25 to 20x20x30. Black nylon fabric is 100% bird safe breathable nontoxic and color fast. Handwashing is recommended. . .
• Large Wrought Iron Flight Cage Features 2 Large Front Doors For Easy Access To Birds and A Bottom Shelf For Storing Food. • Four Plastic Double Cups, 2 Wood Perches and A Pull-Out Bottom Grille and Drawer For Easy Cleaning. 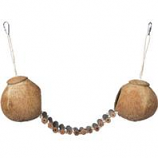 • Designed For Parakeets and Other Small Birds. 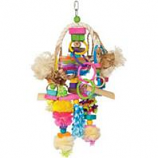 • Includes 8 Hooks For Hanging Toys and Treats, Along With 3 Ladders For Plenty Of Space To Climb. • A Swing In Also Included For Even More Playing Fun. • Double Cups Provide Room For Food, Water and Treats, and Easy Rolling Caster Stand Allows For Easy Movement. • Multiple Stairs In Various Size Provide Great Climbing Surface S and The Rolling Caster Stand Allows For Easy Movement. • Pull-Out Grille With and Drawer, Along With Rounded-Corner Seed Guard Make Cleaning Quick and Easy. 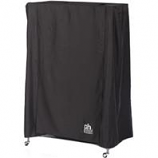 Universal cage cover for bird cages ranging in sizes from 31x21x41 to 37x25x48. Black nylon fabric is 100% bird safe breathable non-toxic and color fast. Handwashing is recommended. . .
• Soft and Fuzzy and Helps Keep Your Birds Protected From Cold Drafts. 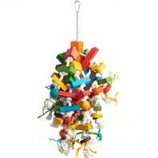 • Hangs Easily In Any Cage From The Attached Hooks and Provides Your Birds With Additional Space For Playing and Sleeping. • Comes In Assorted Red, Green and Blue.